Zračna luka Dubrovnik, which is how Dubrovnik Airport (DBV) is referred to in Croatian, is the third largest airport of Croatia. It serves the sought after tourist area in the southern part of the Croatian Adriatic Coast – see map. The topographic name ‘Čilipi Airport’ is also used for this location. 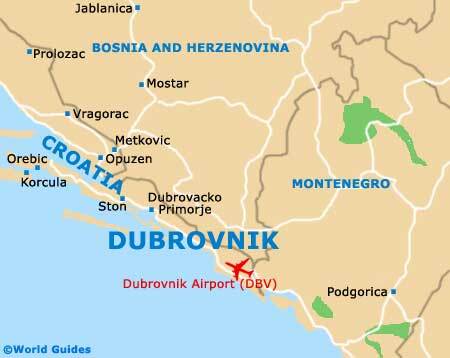 The tremendous popularity of Dubrovnik as a popular destination in the Balkans have contributed to significant growth of the local airport and a continuous development of the network of routes served. After the first phase of thorough remodelling and extension works conducted at Dubrovnik Airport, it became the most modern airport of Croatia. After the works have been completed, the airport stands a chance to become the country’s largest airport. To cater for the growing needs of the tourist traffic, Dubrovnik Airport offers a variety of car rental services, available from both on- and off-site rent-a-car providers. It is possible to rent a car at Dubrovnik Airport from well-known, international companies, such as Avis, Budget, Hertz, Dollar/Thrifty, Sixt, National, Alamo, Europcar, as well as from the local brands, for example Bingo Rent, Uni Rent, Last Minute Rent A Car, Mac Car Rental, Fleet Rent A Car, Nova Rent A Car, Oryx Rent A Car or Avantcar. The seasonal character of tourism in Croatia reflects in significant fluctuation of the price of car rental between the seasons. During the summer, when large numbers of tourists visit the most popular seaside locations along the coast of the Adriatic Sea, the prices of car rental services here increase significantly. It becomes virtually impossible to rent even the smallest car for less than £200-250 for a week. The price of any larger vehicle can easily go up to (and above) £300, for the same period of time. In order to avoid overpaying for car rental in Croatia, do use internet search engines, such as Cartrawler to thoroughly compare rates from many different suppliers before booking. For the customer’s additional benefit, prices of rental cars available online are often substantially lower than those quoted directly by the car rental companies. If you are travelling in a big group and require a vehicle larger than a regular passenger car, be prepare to pay around a £500 at the peak of the tourist season. Minivans and minibuses to rent at Dubrovnik Airport usually come in a short supply; one more reason to book in advance.. Direct flights to Dubrovnik are available from a variety of European airports. From the UK you can fly to Dubrovnik with airlines as Easyjet, Jet2, Monarch Airlines and Thomson Airways, from cities. Bristol, Birmingham, Leeds Bradford, Edinburgh, Glasgow, East Midlands, Manchester and London (Gatwick, Luton and Stansted) are just some of the UK cities with direct links to Dubrovnik. Please note that an overwhelming majority of flights to Dubrovnik are seasonal routes. Minibus rental Dubrovnik. Flights to Dubrovnik from UK.